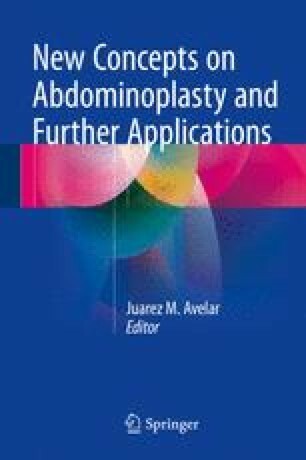 In this chapter the treatment for reparation of the abnormalities on the lower segment of the abdomen due to gynecological surgeries or other operations on the infraumbilical area on the suprapubic region is described. Lower lipoabdominoplasty is indicated for correction of unaesthetic scars; sometimes retractile cicatricial tissue or several other undesirable circumstances give ungraceful appearance to the abdomen. The physical evaluation and the surgical planning are mandatory steps before operation. Indication of this procedure is a question of selecting patients who present basically abnormalities on the infraumbilical segment where the resection of skin will be done. If the patient presents localized adiposity on the supraumbilical segment and/or on the lateral and posterior regions of the torso, these must be treated simultaneously. The operation is performed at a hospital under general or epidural anesthesia, but surgical demarcation must be done prior operation with patient in front of a mirror to follow surgeon’s drawings. Two areas must be well demarcated: (A) the area for skin resection and (B) the areas for liposuction on the abdomen, as well as on the lateral and posterior regions of the torso. In all demarcated regions for liposuction, it is carried out in the deep layer, under the panniculus (below the fascia superficialis). In area of skin resection that is in the suprapubic region, the infiltration must be done underneath the skin and the full thickness of the panniculus (in the areolar and lamellar layers). Firstly liposuction is performed on full thickness of the panniculus followed by skin resection. The remaining panniculus above the raw area slides easily over the musculoaponeurotic wall because there is no fat below the fascia superficialis. All perforator vessels are preserved which work as multiple pedicles to the abdominal panniculus. Plication of the musculoaponeurotic wall can be performed. Computed tomography is a routine examination which demonstrates the distance between the muscles and even hernia on the midline and laterally as well. Afterward the upper border of the abdominal panniculus is pulled downward to be sutured to the inferior border in order to close the surgical wound. Three levels of suture must be done: on the fascia superficialis, on the subdermal layer, and on the dermis. Such sutures avoid any scar depression after surgery. The bandaging is done by a special garment which covers smoothly the torso without any tension.